Land and land tenure issues have been and will continue to be high on the policy agenda in a large number of countries, including those in Africa and Asia. The highly political and contested nature of land policy issues makes it highly relevant to provide in-depth analyses of such issues in diverse contexts. While attempts have been made to develop ‘silver bullet’ solutions in this area, we advocate humility in the causal analysis of past reforms due to the contextual complexity and limited data quality as well as in the prescription for future land tenure reforms. Pilot testing before scaling up based on empirical evidence seems like an approach with higher probability of success as compared to some of the large-scale failed interventions of the past. 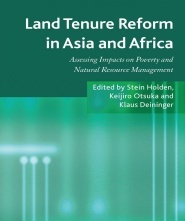 While the book has primarily been written by economists who have used sophisticated statistical methods in the analysis of large datasets, the editors have attempted to keep the book non-technical to make it accessible to the broader public interested in land tenure policy issues. Many of the interpretations and conclusions are tentative, with the intention of creating constructive and open-minded debate. Such debates are fundamental for the development of evidence-based land tenure policies conducive to efficiency, equity, and sustainability of farm and forest land management in the future.